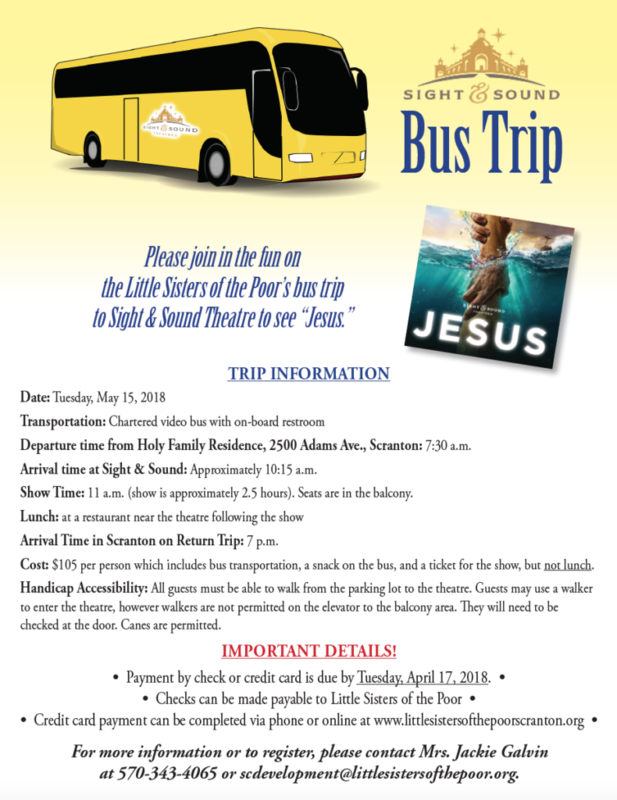 The Little Sisters of the Poor are sponsoring a bus trip to Sight & Sound Theatre to see “Jesus” on Tuesday, May 15. The bus will leave at 7:30 a.m. from Holy Family Residence, 2500 Adams Ave., Scranton, and return to the residence at 7 p.m. The cost is $105 per person which includes transportation via a video bus with an on-board restroom, light refreshments served on the bus, and a balcony section ticket. All guests must be able to walk from the parking lot to the theatre. Guests may use a walker to enter the theatre, however walkers are not permitted on the elevator to the balcony area. They will need to be checked at the door. Canes are permitted. Following the show, guests will stop for lunch at a restaurant near the theatre. To make a reservation, please contact Jackie Galvin, director of development and communications, for the Little Sisters of the Poor at 570-343-4065 or scdevelopment@littlesistersofthepoor.org by Tuesday, April 17. Reservations can also be made online at www.littlesistersofthepoorscraton.org.